Have you ever tried riding on a solar powered bicycle? No, they are not just any ordinary bicycles that you usually see on the streets! It may be hard to find these type of bicycles but they are often an inexpensive and eco-friendly form of transport. Powered by solar energy, solar powered bicycles store its energy in special engines built onto the bicycles themselves. They don’t have a very long range, but you can learn to make your own from scratch and save your legs. With a friendly guide here, you can pretty much start off building your very own solar-powered bicycle anytime soon! It’s a simple and versatile bicycle powered by the sun, and can go anywhere from 7 to 30 miles per hour. It’s great for city use, as it does not emit pollution, and you can even ride to school, work or any place without sweating and smelling badly. It’s a very convenient and inexpensive form of transport, perfect for just any of your outdoor activities. Bicycles are the most common form of transport. With the recent increase in the price of car petrol, we know everyone is trying their best to save up on car petrol and expenses. This is when a solar-powered bicycle is the most useful and convenient! If you’re trying to save up on car petrol and that you are aiming for a cheaper, low maintenance form of transportation, you have definitely come to the right place. Read on for a guide on how to build your own solar-powered bicycle for an environmental-friendly ride to your destination. To start off, get yourself a simple bicycle, panels, battery and an inverter. You should consider solar panels that are light but large. Having a larger surface area means that your panel will be able to capture more energy. It would be best to shop around and see what is available in the market, as well as which ones won’t interfere with your cycling capabilities. Batteries are usually charged with a 240V or a 12V battery charger. We haven’t found an easy way to plug the panel to the bicycle’s battery. There is another way that we suggest users can try. You can plug the panel to the inverter. The power would go from DC to AC, and later on, back to DC. This leads to a result of about 20% loss in efficiency. 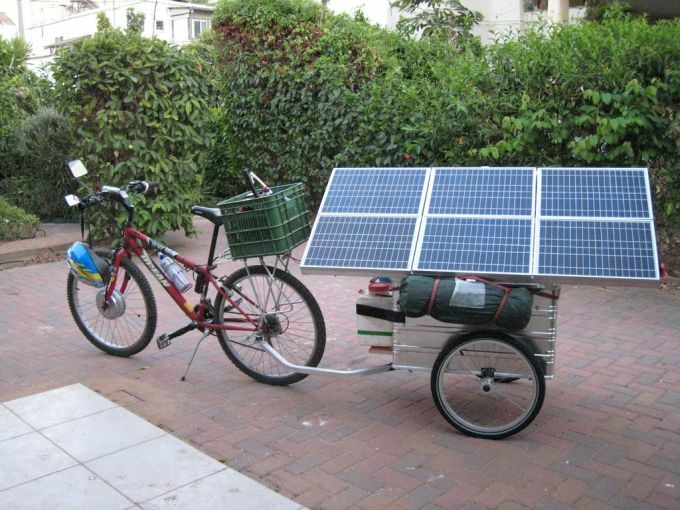 The total weight of the battery and the inverter adds about 6 pounds more to the total weight of the bicycle. It makes it a lot heavier, but it works. So, how do you build your own solar-powered bicycle? It’s a fun experiment to build a solar-powered bicycle. Firstly, if you are new to solar-powered bicycles, keep in mind that the bicycle depends on your pedal power and how you ride on it. The range of solar-powered bicycles tends to be subjective. Start by completely having the tricycle disassembled. Then, you can choose whether to repaint the whole vehicle with your favorite color. This step may be unnecessary as it depends on personal preferences. Do skip this step if you do not intend to change the color of the vehicle. The vehicle should be running on solar energy so from here, you can reinforce the frame, add on the Lead acid batteries. You don’t have to worry about the cost of the batteries as these are pretty cheap and can be easily found in local stores. A single tube can be welded in to minimize the load with 4 points divided instead of just two. You then have to tie the rear sub-frame altogether in which the tube will then act as the load bearer. The drivetrain should only consist of the electrical system and this is where you install the electric motor. You can easily purchase it online, which costs approximately $260 and it comes with a wheel on the front with a 36 Volt electric motor as a part of the hub. You’ll also have other accessories standby, such as the grip throttle, brake levers that are wired so you can use it to cut the power of the system, an indicator to indicate the level of battery and the speed-controller for the system. Generally, these tools can be found in the DIY kits sold in the stores for DIY solar-powered bicycles. After you’ve installed the motor, you will need to route the wires back on the rear of the basket of the bicycle. You can leave the slack around the wires so that the wires won’t be in tension when you steer it at a maximum angle. Do remember to choose only the right and suitable batteries. The type of battery that is suitable for the bicycle should be reasonable in price, weight and range. Don’t forget the time it takes to charge up those batteries in which you’ll also need to consider! As a suggestion, you can try the batteries that can be found at just any local warehouse, that are sold for $20 each and from our experiment, it worked really well. These batteries can last longer but it also requires a longer time to charge. You can add a battery to the bicycle so that when you ride the bike, you don’t have to unplug the pack to switch off the whole electrical system. Next, we move on to the solar panels that you can add to the bicycle. We have bought the 3Q-cell mono-crystalline solar panels that are sold at $110 each, and these solar panels produce 21.8 volts maximum and minimum 17 volts, at about 1.2 amps. With 3 solar panels installed in the vehicle, that makes a total of approximately 66 volts maximum and 51 volts minimum, which is a lot over the 42V needed to charge the batteries. Lastly, you will have to consider how you will be going to pedal your bicycle and mount the panels on it. Weld the basket with hinges to allow them to tilt for access for the basket, and get a rubber to hold it on the other side to keep them closed for the rider when riding the bicycle. Once you have installed all the necessary components and that all the wires are routed and properly zip-tied, your solar panels and batteries must be held down and you should always double check that everything is perfectly installed before you are ready to go. Solar-powered bicycles offer great benefits and are just as good as ordinary bicycles. If you’re the type of person who may have some issues with your knee and may experience pain in the kneecap due to excessive exercising, this type of bicycle would be an ideal bicycle for you. You can get to work without sweating too much and the fact that it does not run on fuel, you can say that the bicycle is less costly in comparison with a car. You can cycle your way to your destination safely and the best part is, you can get to your workplace in time because you can avoid traffic! Can You Go Far While Riding on A Solar Powered Bicycle? A good formula to keep in mind would be to divide the energy (watts) hours by 20. The solar-powered bicycles that have batteries usually use 36 volts of power and 10 amp hours of capacity. As an example, 36 x 10 is equal to 360 watt and hours. If you divide the sum by 20, you will get 18 m. If the difference is only 18, the rider of the bicycle, while pedalling manually will contribute power, that is why systems will be leveraged. Solar-powered bicycles offer great flexibility because you can still pull it along if you can’t manually pedal it. In some cases, some solar powered bicycles have a low level of assistance and is able to reach approximately 50 miles on a single charge, which is fantastic, no doubt! Asking yourself the same question in conclusion, should you really build your own solar-powered bicycle? Before you come to a decision on whether to build a solar-powered bicycle, consider the places you need to travel to, using this bicycle. Is the place far from your place? Or is it just a short distance away? Anywhere that is longer than 30 minutes is considered far. In advise to those who are considering on getting themselves a solar-powered bicycle, we suggest you only build your own solar-powered bicycle if you’re only traveling back and forth places that are not too far away. The bicycle requires panels, battery and inverters, which may sound costly to most people and it may not be worth for people who are traveling to places that requires traveling long distances. If one can find a way to connect the panel to the battery of the bicycle, this would help lessen the weight and the cost. For those that are looking for a bicycle for just cycling and not for any specific traveling purposes, we recommend that you give the solar-powered bicycle a try. These solar-powered bicycles can fun from 15km up to 40km after a charge and the bicycles often take long hours to charge. You can still pedal while riding on the bicycle when its battery has already died, that is not a problem, however, the solar-powered bike can be heavy and it can be quite a hassle to pedal uphill, which makes it inconvenient as a form of transport if it loses charge. Not sure about how most travellers are, but we’re pretty sure most would not like the experience of being stuck with an uncharged and heavy vehicle that can hardly take the person anywhere without enough effort on pedalling. You may like the bicycle in the sense that it is light weight as a vehicle that can take you to places in short distances, in a short time, saving you the cost of fuel as it powers with solar energy. You can easily ride the bicycle out for 70km while pedalling manually but if you’re thinking of going up to 130km and above, for an athlete, you are beating out a solar-powered bicycle. The solar-powered bicycle requires low maintenance, so this may be the form of transport that fits within your budget. It’s green and environmental-friendly, but best for traveling to places that are in short distances. It’s not suitable for traveling to places that are far off and will take lots of time. Why Would You Go for A Solar Powered Bicycle? Just like any ordinary bicycle that offers the convenience of traveling from one place to another, it does not require insurance or license in most countries and in most cases, it helps improve your overall health as it involves exercising when you’re manually pedalling. Unlike cars and buses that require fuel and produces exhaust fumes, you don’t have to worry about solar-powered bicycles as they are green and environmental-friendly, it will not cause pollution and contamination. Bicycles may be able to solve your roadblock issues. They are the cheapest form of transport if you compare them to cars in which petrol may be costly. Not all countries would permit commuting to work by solar-powered bicycles. In China, you are not allowed to use solar-powered bicycles in Shenzhen but it is fine for cities such as Beijing and Shanghai. As every state has different legislations and licence requirements, do your research before getting one in your country! You’ll find that in European countries, citizens are not allowed to ride on solar-powered bicycles, therefore, you can only travel using ordinary bicycles, cars or other transportations. Also in countries such as North America, you will find that there are specific lanes made just for non-motorized vehicles, which means that users have the choice of driving cars in the car lane which may be a little more dangerous. In most countries, however, electrical or manual pedaling bicycles may not require an insurance or a license. But all users must make sure that they cannot exceed speed of 25 km/h, and the vehicle cannot be more than 40kg in weight. The solar-powered bicycle may have a battery attached to it, but there is a requirement that it cannot exceed 250W in power. Once it runs out of battery, you can still pedal it manually but in some countries, they would offer state financing for such vehicles. We suggest doing sufficient research before getting your bicycle on the high road. In conclusion, the laws of different places are not very consistent and in the near future, we hope that it can be improved so that outdoor adventurers can always try out for a different form of vehicle for their convenience. Along with the recent battery technology, much still needs to be done for further improvement as at present, it only allows easy transport to places of short distances.